All of us, at some time or another, encounter energy blocks that make life less than joyful. It could be our relationships that are off-kilter. Maybe we're being impatient or too demanding. Maybe we're feeling used, ignored, or unloved by those we care for. Maybe we're not happy with our own behavior. We're down on ourselves for not having the energy to tackle all we should do, or we're ashamed of procrastination. Maybe we've just gotten into a funk and don't want to do a darned thing! Whatever the reason, any time we're not going about our days happy within our own skins, it's time to do something about it. It doesn't matter if the problem is chronic or if it comes and goes. It still interferes with living and loving life. So if you're feeling less than joyful all the time or if you just hit weeks when life throws you off balance, look to Dr. Bach's essences to pull you out of it. You can visit this overview page to get an idea about the essences that will help you. Then go to our reference guide to get more detailed information about each of the essences. If you're still not sure what flower essences to use to pull yourself out of the doldrums, go to the FeelBach! questionnaire. Be absolutely honest with yourself about your feelings, and the Feel Bach! experts will help you choose a blend that will put you back on the path to joyful living. Life is too precious to waste your days feeling less than your best, so let Dr. Bach's essences help. Do you ever get days or weeks when you're just too tired to want to do anything? It might feel like physical fatigue (when you haven't done anything physical) or mental fatigue, but it certainly is debilitating. Olive is the flower essence to get you out of the funk and back on track. If you're a natural Olive personality, this state is especially distressing. You're used to being up-beat, energetic, in-charge, and ready to take on everything life offers. And now, you just don't care to do anything. Some days you simply want to sit, or take a nap. You aren't even interested in reading a book or watching television. Ignoring the symptoms of the negative Olive state can actually lead to physical illness, so it's best to nip it in the bud with the Olive flower essence. This blocked energy flow can cause reduced kidney function, reduced oxygen flow, and internal toxicity. In other words, it's nothing to ignore. Olive is often used to help people who are recovering from a long illness - even alcoholism. 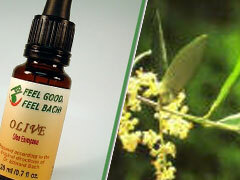 So if you've lost your normal energetic personality, get the Olive essence from FeelBach! and feel better quickly. 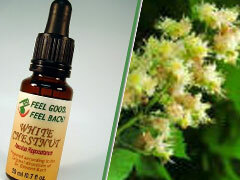 Last week we talked about White Chestnut, and how it can help you stop your mind from going over and over and over events that have happened - and worries about events that could happen. If guilt is the reason why your thoughts won't let go, add Pine to your formula. Everyone has made mistakes, but some of us can't seem to let go of them and move on. Sometimes it's our own mistakes that hang on - sometimes it's an inability to forgive and forget someone else's mistakes. People who suffer from a chronic negative Pine state even feel guilty for mistakes other people make - and for events that aren't actually mistakes at all. They just feel guilty from morning to night - often for no good reason. If you know someone in this state, you've probably noticed that they say "I'm sorry dozens of times each day." Hanging on to all that guilt is detrimental to health and happiness - both for the sufferer and for the people who care about him or her. So if you're the one suffering, put a stop to it. 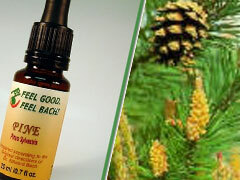 Get the essence Pine from FeelBach! and feel good soon.